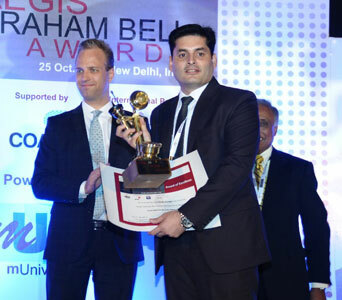 The Aegis Graham Bell Awards, promoting innovation and entrepreneurship, and India’s most important awards in the fields of TIME (Telecom, Internet, Media and Edutainment) were held on 25th October 2013 at the NDMC Convention center in New Delhi. The awards honored the best innovations in the fields of TIME and were initiated by the Aegis School of Business, Telecom and Convergence India, with support from COAI [the Cellular Operators Association of India], mUniversity as powered partner and Ontario Canada as international partner. PwC was the knowledge partner who validated the awards. This year organisers received more than 140 nominations from over 80 companies in two jury rounds. The nominations were evaluated by a jury consisting of eminent personalities with PwC, the knowledge partner, validating the final awards. Radio Design won the award in the category “Network Sharing,” where the two final nominees were Radio Design (“Site Sharing Filter Combiners”) and NSN (“Flexi Compact Base Station”). Radio Design is both delighted and proud to win the “Innovation In Network Sharing” Aegis Graham Bell Award 2013, and would like to thank all of its customers, suppliers and partners for their continued support – This award is a worthy testament to our joint efforts.